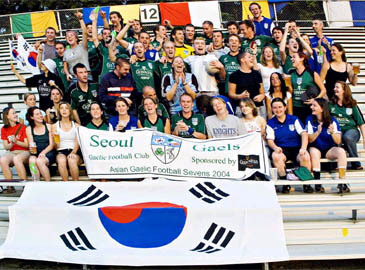 Seoul Gaels celebrate their triump in Hong Kong. The Korea Men's team continued their winning ways in Hong Kong last weekend to become the first team ever to complete an Asian Gaelic Games three-in-a-row, taking the new Derek Brady trophy 'home' to Korea and cementing their place as the dominant force in Asian Mens Gaelic football. Tom Cummins of Carlow/Incheon, Ireland was selected by his opponents as the 2004 Player of the Tournament for his outstanding performance in goal, most crucially in the semifinal against a 'physical' Dubai side. For the Gaels, young Declan Burke picked up his second winners medal, while the veterans of Ed Cosgrove, Kevin Hayes, Karol Rushe and Noel Raggett all completed the treble. Noel Raggett said "This years competition was the toughest of the three we have won. We have set ourselves high standards in the last two tournaments and this year was the first time that the other teams came close to reaching our standard." The Women's Team delivering a very respectable performance by coming in 3rd place in the Women's Competition but will rue their missed chances in the semi-final. They were one of the best sides in the competition but unfortunately things just didn't go their way on the day. However they have the consellation of finally breaking their hoodoo by beating reigning champions Japan on Saturday. The Men's B Team reeled off an impressive set of results with four wins and only one costly defeat which ended their tournament. Canadian JF Chapman from the B team said "This was the greatest sporting event I've had the honor of competing in, I love playing Gaelic football its so fast and skillful and this tournament was what I've focused on for the last 3 months, well done to the A team they really showed their class. Tom Coyner Seoul Gaels Chairman said "There was alot of pressure on this team before the competition for them to complete a three in a row of Asian title, and despite fierce competition they have achieved this. With this magnificent result the pressure has lifted. I'm very proud to be a part of this club and for all the members achievements." 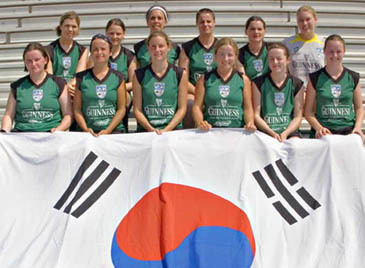 Seoul Gaels have been proudly sponsored by Guinness.